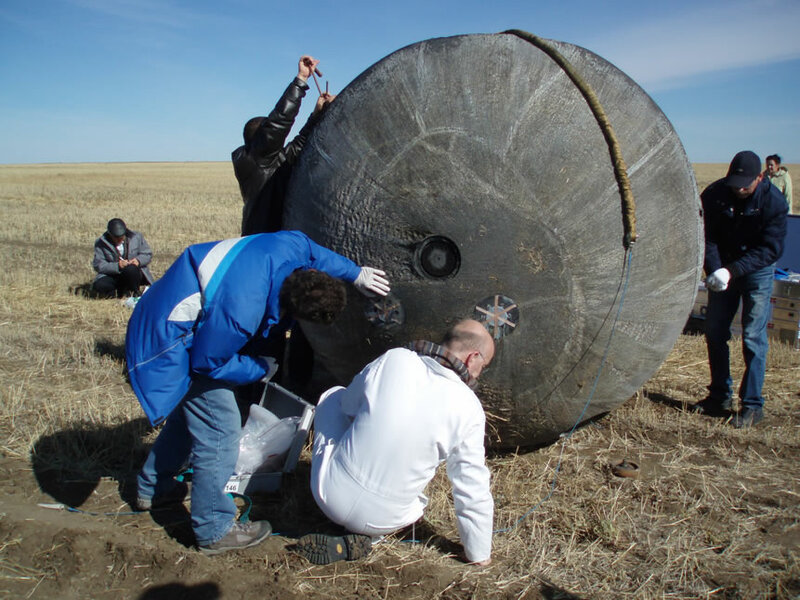 After 12 days in orbit, the Foton capsule landed back on Earth in Kazakhstan 26 September with its 43 scientific experiments intact. French exobiologists have since started working in the laboratory on samples returned from the European experiments on board. Three rock samples—2 of them sedimentary rocks—were embedded in Foton’s heatshield. As the return capsule re-entered the atmosphere, these rocks were subjected to the same kind of heating and environment experienced by meteorites when they fall to Earth. The sample holders containing the rocks exposed to atmospheric re-entry conditions are clearly visible. One of them has been torn away with its rock. Right, a close-up of one of the rocks fused by the heat of re-entry. Such meteorites could have seeded Earth with organic molecules or possibly extraterrestrial organisms. Initial results from the rock experiment are encouraging, as the 2 sedimentary rocks out of the 3 sent into space withstood re-entry. What’s more, micro-organisms buried inside these man-made meteorites also made it back to Earth, burnt but preserved, “a bit like the inhabitants of Pompeii,” says Westall. Foton also brought back 120 small glass-walled boxes containing solid deposits and gas mixtures concocted under the direction of Hervé Cottin by the LISA atmospheric systems laboratory at Paris XII University. Samples from the Uvolution experiment on the Foton capsule. During the mission, organic molecules were exposed to solar ultraviolet radiation. This high-energy radiation is blocked out by the atmosphere and doesn’t reach Earth’s surface. Samples from the Uvolution experiment. Researchers can thus simulate the chemical reactions that occur in comets, in the atmosphere of Titan or on the surface of Mars. “Gaining more insight into the nature and evolution of organic matter in these environments will provide new clues to understand the origin of life on Earth, and possibly to look for extraterrestrial lifeforms,” concludes Hervé Cottin.